Jessica Mitford used a typewriter the way others would a sniper rifle. An investigative journalist who exposed the seedier underpinnings of the funeral industry and sounded alarms over medical impropriety, nothing seemed to escape her attention. She even outed her own sister as a Nazi sympathizer. In the late 1960s, Mitford met a client of her lawyer husband who was in significant distress. The woman, 72, had given over every last dollar of her savings to a salesman representing Famous Writers School, a mail-order correspondence business that peppered magazines and paperback books with ads promising aspiring writers personalized guidance. Famous Writers was so named for its “guiding council” of established and celebrated authors including Rod Serling of The Twilight Zone, Max Shulman, and Faith Baldwin. Bennett Cerf, a key publishing figure at Random House and well-known for his appearances on television, co-founded the school. Several of these faces appeared in promotional material, encouraging would-be authors to enroll in the program they had designed. The claims, Mitford found, were difficult to believe: that writers would receive personalized guidance, that “aptitude” tests would weed out those unworthy of their attention, and that success awaited those who adhered to their lesson plan, which could cost upwards of $900. After learning the woman was refused a refund for the $200 she had spent as a down payment, Mitford decided to investigate. Mitford sought comment from the Famous Writers themselves, who appeared aghast that anyone would think they had any personal involvement in the school’s operations. "Anyone with common sense would know that the fifteen of us are much too busy to read the manuscripts the students send in,” said Faith Baldwin. The parent company, Famous Schools, was a staggeringly lucrative venture, bringing in $48 million in revenue in 1969. The writers helped prepare textbooks and appeared in advertising, acting as spokespeople. In return, they received a share of profits. "Oh, come on, you must be pulling my leg—no person of any sophistication, whose book we'd publish, would have to take a mail-order course to learn how to write...The crux of it is a very hard sales pitch, an appeal to the gullible. Of course, once somebody has signed a contract with Famous Writers he can't get out of it, but that's true with every business in the country." 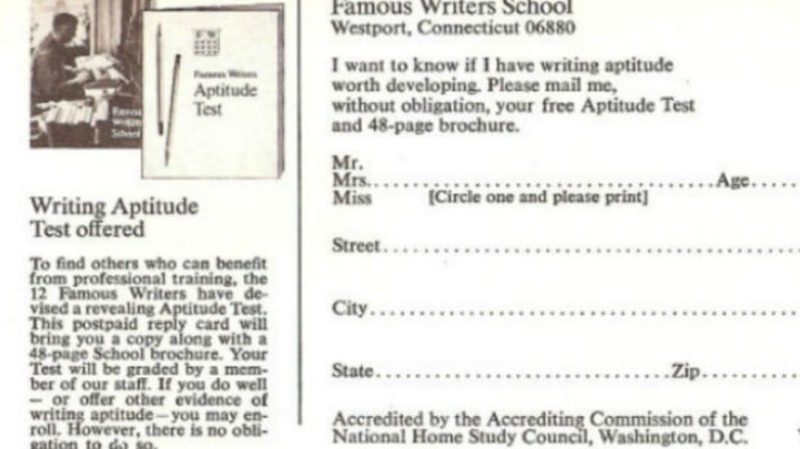 The Atlantic was initially reluctant to publish Mitford’s expose, wary of alienating Famous Writers School after having accepted a substantial amount in advertising money from the company. But Mitford’s story was compelling enough for the magazine to cancel the contract. It became their highest-selling issue up to that point. Readers were intrigued—writers (and would-be customers) were appalled. Famous Writers School saw a radical drop in enrollment. In 1972, Famous Schools underwent bankruptcy reorganization, evaporating their Famous Writer program from ad pages and dissolving partnerships with their spokespeople. "I'm only a figurehead,” one of the writers, Phyllis McGinley, had told Mitford. "I thought a person had to be qualified to take the course, but since I never see any of the applications or the lessons, I don't know. Of course, somebody with a real gift for writing wouldn't have to be taught to write."